"Blind Spot & Painted Studio Floor" are the instalment of "Republic Empire" (Filter Hamburg). The video-loop was recorded uncut on a 60min VHS tape in the half of the room which was accessible. The other half was occupied by a former studio work table into which a vigorous motor is integrated. It turns a massive steel propeller at such a high speed that it is almost non visible. Yet it makes a threatening loud noise and flow of air. It is so daunting and obviously dangerous that no one staid longer than a view seconds even in the save are. The creator itself is reduced to inaction, blind and numb. 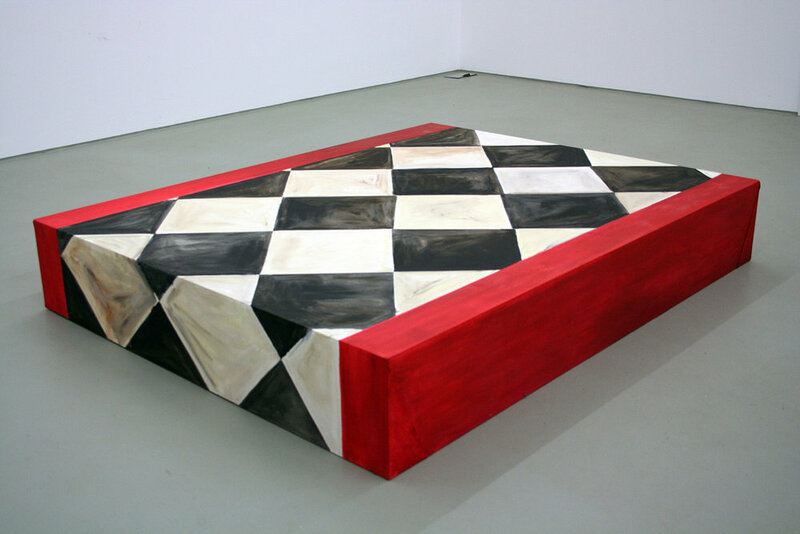 Painted Studio Floor is a 1:1 adaption and serves as a pedestal to the video.